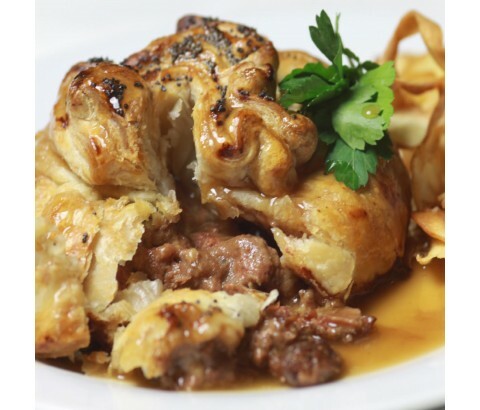 Tender British Steak in a dark, rich Guinness gravy, all wrapped in a handmade puff pastry purse and finished with a sprinkle of Paprika. A perfect dish thats comforting and extremely delicious. Great to have in your freezer, a quick & easy meal. Cook from frozen until golden brown and serve! Beef 28% Guinness 2% Pastry (wheatflour, margarine, salt). Gravy (modified starch, wheatflour, salt, colour caramel, vegetable protein, onion, flavour enhancer e621, celery seed, spice extract, herb extract).